The 628 Saint-Jacques condominium project will be located on Saint-Jacques Street facing Square Victoria, sitting on the borders of both Old Montreal and downtown. This spectacular location will ensure residents have quick and easy access to all the amenities, entertainment and services they want and need. The 628 Saint-Jacques offers proximity to the historic charm of Old Montreal; to its picturesque streets, entertainment venues and fine dining establishments; to bike paths and beautiful green spaces and, of course, to the Old Port and all its attractions. Business destinations, restaurants, shopping, Montreal’s world-renowned festivals, concert halls, theatres, cinemas, bars and clubs, and everything else you can imagine… it’s all there for the taking, just a short distance from the front door of the 628 Saint-Jacques. The entrance to Square-Victoria-OACI metro station is located right across the street, giving residents access to the entire STM metro system as well as to Montreal’s vast underground city, the RÉSO, and the city’s various rail lines. There is also a BIXI bike sharing station just outside the building, a car sharing station around the corner, and more than 10 local bus lines in the immediate area. Get your daily caffeine fix at one of the 15 local coffee shops. Grab a bite to eat at one of the several nearby casual dining restaurants. Discover the numerous cultural venues all within 1000 metres of your home, including several museums, art galleries and cinemas. Or meet up with friends for a happy-hour cocktail or for an exhilarating night out on the town at one of over 14 local pubs, bars, taverns, night clubs and other hot spots. With its proximity to both downtown and Old Montreal, the 628 Saint-Jacques offers the luxury of choice when it comes to eating out and eating well. Nearby renowned dining establishments include Toqué!, XO Le Restaurant, Garde Manger, Decca 77 and Le Club Chasse et Pêche. Several other highly acclaimed restaurants are located within easy walking distance. Since there’s no need to drive, you can enjoy your glass of fine wine worry-free. Within 3 blocks of the 628 Saint-Jacques you will find over 15 boutiques and specialty shops. 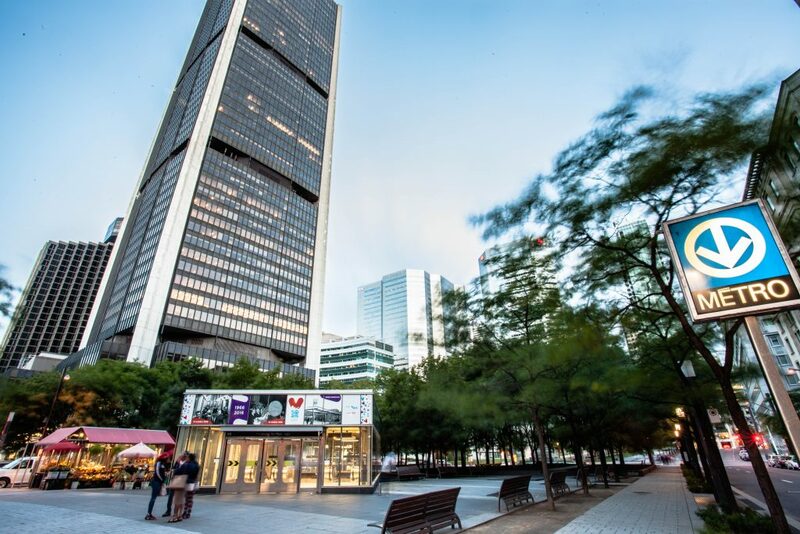 For a more intensive shopping spree, why not walk to some of Montreal’s nearby major shopping centres, including Place Ville Marie, Complexe Desjardins, Complexe Les Ailes, Eaton Center, Place Montreal Trust, and Les Cours Mont-Royal. In the winter, you can even forego the heavy coat and boots… Just cross the street to Square-Victoria-OACI metro station and access these malls, and many more, via Montreal’s underground city. Over 15 convenience stores, delis, gourmet food shops, grocery stores and supermarkets, including a major chain grocery store, are all located within 1000 metres or less of the 628 Saint-Jacques. Within 3 blocks, you’ll also find, 8 banks and financial institutions, 3 pharmacies and 3 dry cleaners. Nearby parks, urban squares and green spaces include Square Victoria, Place d’Youville, Place du Canada, Dorchester Square, Place des Festivals and The Old Port. You would be hard pressed to find a more privileged location in Montreal. If you are interested in learning more about this prestigious project, register here to receive email updates, contact us or come see us at the 628 Saint-Jacques sales office.